Harley Quinn #56 Review – AiPT! When an aging cat burglar’s clowder of felonious felines begins to violently aggravate Harley’s allergies, the antihero-turned-building manager must find adoptive homes for her tenant’s pets. Unfortunately, the “Men O’Paws” pet store doesn’t take it too kindly when the “Quinnpin of Crime” begins to encroach on its territory. Will Harley find herself at the top of this “purrramid” of pet stores or will she be scooped away with yesterday’s litter? Harley Quinn is quickly becoming one of the titles that I am looking forward to the most each month. This is not because of some grandiose, multiverse-shattering story-line that promises to change everything (and often doesn’t), but just because it is fun. This is not to say that the series does not tackle serious topics, because it certainly does make social commentary, but the difference here is in the execution. Harley Quinn #56 uses the titular character to discuss sexism and the Comicsgate movement. 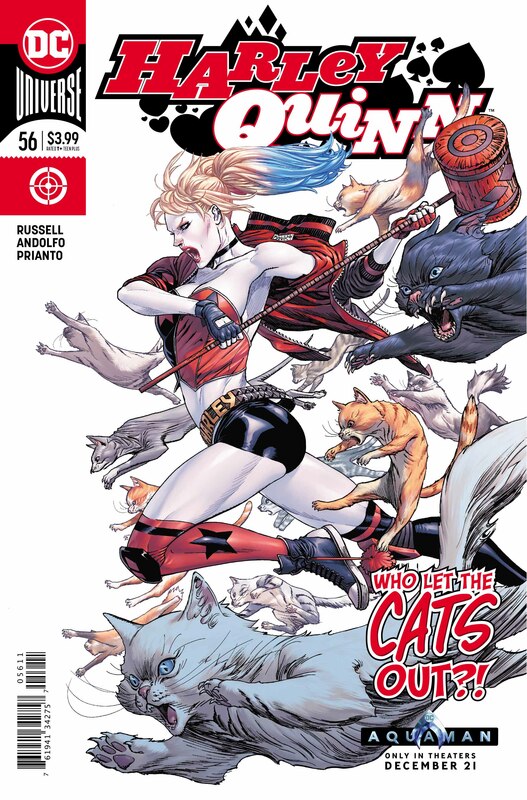 It is to guest-writer Mark Russell’s credit that Harley Quinn #56 provides this commentary without ever taking itself too seriously nor diminishing the message. The satire is a massive part of what makes this issue so enjoyable. From the issue’s title, “Pettergate,” to threats of violence, and overwhelming mobs with catchphrases to vandalism, Mark Russell draws a several parallels to events within the Comicsgate movement with the subtlety of a jackhammer at two o’clock in the morning. I think part of what may turn some readers off is just how thinly veiled the commentary is within this issue and that is okay. I think that sometimes in order to get your message across you have to be direct and not mince words. You do not want you message to be clouded in metaphors or misconstrued for something that it is not. This is especially true when certain members of your audience may not want to buy in to what you are saying. Although some readers may not like the directness of the message, I can understand and appreciate the direct approach here. Due to her personality, and recent penchant for breaking the fourth wall, I think Harley Quinn is a perfect character choice to make such a direct message to the audience. Mark Russell’s dialogue is one of the highlights of this issue. One of my favorite sequences is when the Pettergate mob comes to Harley’s doorstep armed with torches. Harley pleads to reason with them and Nate responds, “It’s too late! They’ve already gone into their catchphrases.” It was a moment that had me laughing out loud because of the inherent silliness within this moment’s truth. As the Pettergate horde descends upon Harley and her allies, the masses moan quotes straight from social media. This sequence shows the synergy between Mark Russell, Mirka Andolfo, and Arif Prianto. With dark colors, and characters busting through windows, Andolfo’s art with Prianto’s colors provide a setting similar to that of a zombie movie that never betrays the issue’s overall tone. It is the juxtaposition of the images of violence with social media quotes like, “It’s about preserving tradition” and “I only wanted to have an honest debate,” that makes these moments work. It is not hard to imagine that this is the visual representation of the hoard of bloodthirsty internet denizens descending upon its unsuspecting prey. Moments like this perfectly demonstrate Russell’s ability to provide humorous commentary without diminishing his message. Additionally, Russell’s characterization of a majority of these characters feels true. Although they may appear rough behind their masks (internet anonymity), they are just confused boys. This goes a long way to making the antagonists of this issue not feel evil. Characterizing the members of this movement as evil would have been a huge misstep on Russell’s part because of the obvious parallels to Comicsgate. In a time when individuals are quick to classify people with different opinions over social media as evil, I think it is important to recognize that just because someone disagrees with you does not make them inherently evil. This is not to say that it makes them right, but it does not make them evil. Mark Russell uses Harley Quinn #46 to explain, but not justify, the reasoning behind the Pettergate hoard’s behavior. He posits that the culprit is nostalgia. Nostalgia is one heck of a drug. It can make us believe that the past is better than what it was. Nostalgia can also lead to a stagnation of ideas and resistance to change. In the final moments of the issue, Russell is saying that it is impossible, or nearly impossible, to change the opinion of someone who has already made up his or her mind. This statement feels like a negative note to end the issue. There is a lack of hope here. However, I think it is important to note that the hope here lies within the future generation. Harley provides that glimmer of hope earlier when she says, “I just hope somebody gets to them while they’re stupid and malleable.” Mark Russell is saying here that he hopes we are able to reach the youth earlier before their minds are set in stone. Ultimately, Harley Quinn #56 is a great issue that provides social commentary without ever taking itself too seriously nor diminishing the message. Mark Russell’s dialogue juxtaposed against Mirka Adolfo’s wonderful art provides an enjoyable satiric read that had me laughing out loud at times. Some readers will undoubtedly not appreciate Russell’s approach nor the message that Russell is trying to send here. I think it speaks volumes that he uses Harley’s character to explain that he is okay with making people upset. My only true complaint for this issue: Now I am hungry for a Pepto-Dog. Harley Quinn #56 provides excellent social commentary without taking itself too seriously nor diminishing the message. The juxtaposition of character dialogue with Mirka Andolfo's wonderful art. Mark Russell's social commentary through satire. Not everyone will appreciate Russell's approach or message here. Perhaps this isn't so much a negative as it is a neutral statement, because of the writer's intentions. Now, I have an insatiable hankering for a Pepto-Dog.